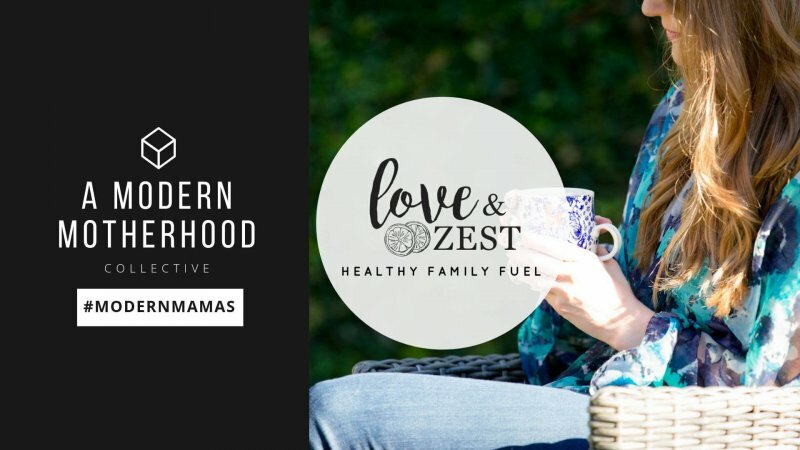 Thanks NFRA (National Frozen & Refrigerated Foods Association) for partnering with Love & Zest this year to sponsor this blog post. 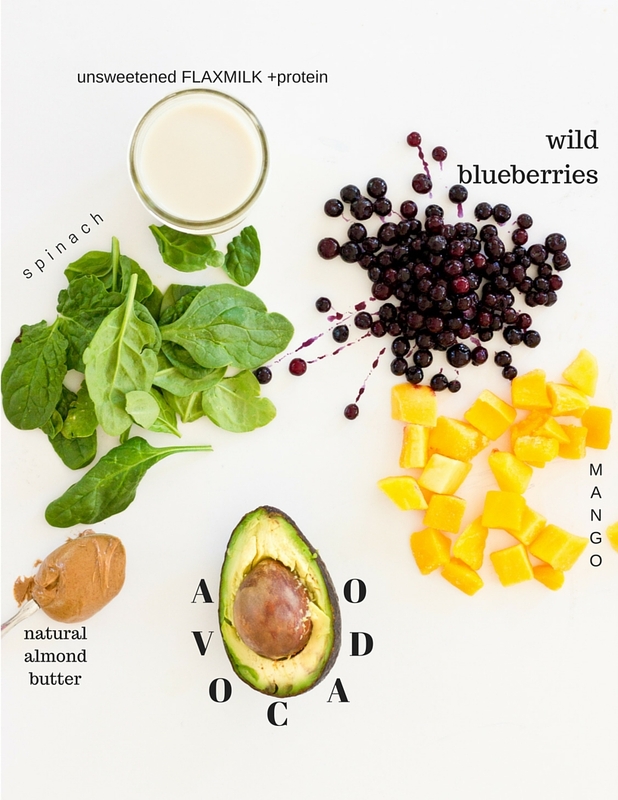 With summer quickly approaching, this superfood smoothie bowl will keep you cool and fueled on the sunniest days. 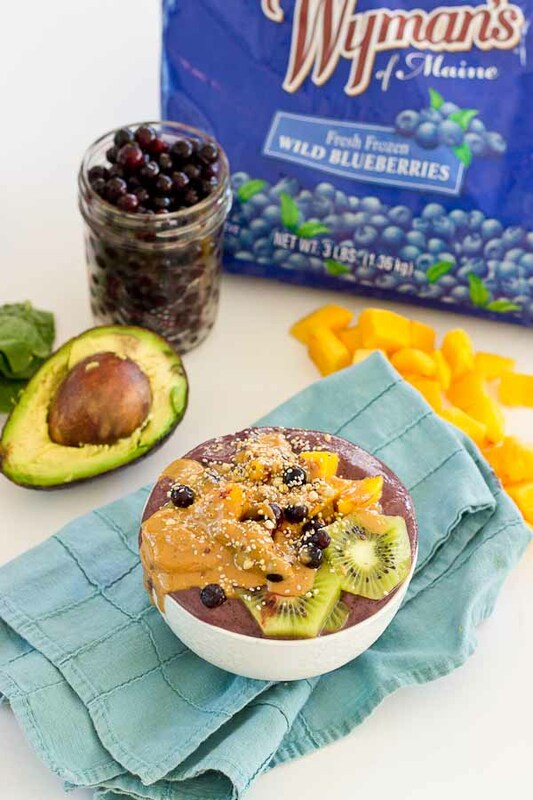 Wild blueberries, spinach, avocado, and flaxmilk combine to form a creamy, antioxidant-packed bowl that is vegan and gluten-free! 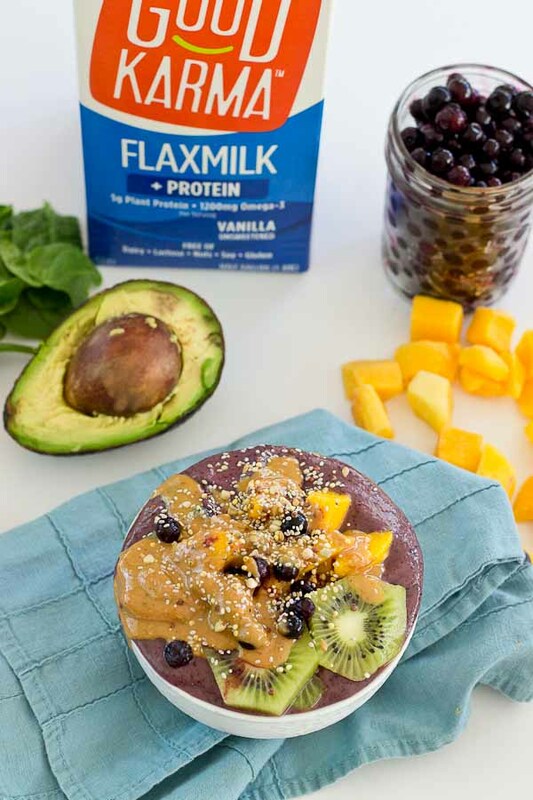 Slices of fresh kiwi and a drizzle of almond butter make this smoothie bowl practically irresistible. I’m quite obsessed with smoothies as you may very well be aware of after <<Smoothie Week>> in January. With over 40+ recipes (the number continues to grow) on this blog dedicated to drinkable or spoonable frozen nutrition, I’ve tested and tasted my fair share of smoothie goodness. 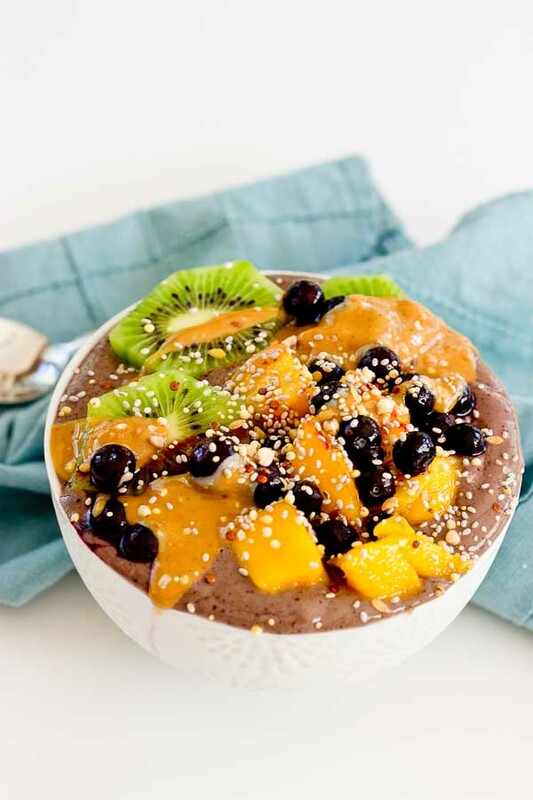 Yep, that’s how crazy I am about smoothies, and the smoothie bowl is the greatest of these, when you have time for spoon luxury. Yes, eating with utensils is a luxurious thing to do these days. With a 6 month old on my hip that loves to grab at everything in sight, I often resort to food that I can sip through a straw or finger foods that I can eat on the go. 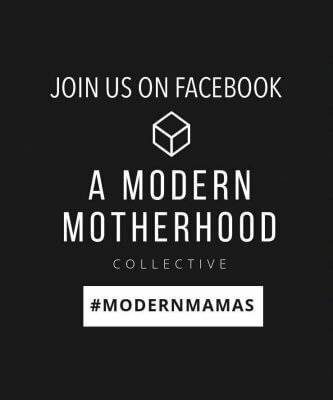 Maintaining a healthy lifestyle while being a working “stay-at-home” mom with a full schedule convenience is king. And this is why I’m excited to be partnering with NFRA, this year. 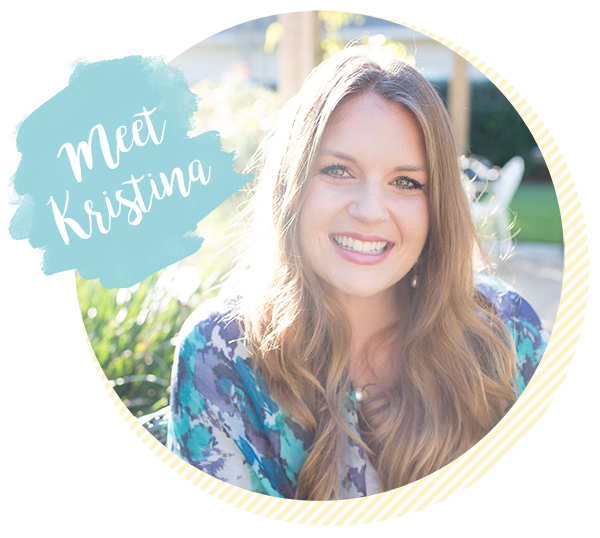 I’m all about the convenience of frozen foods, hello frozen fruit in my smoothie bowl and the deliciousness found in the dairy aisle that make my smoothies lusciously creamy! 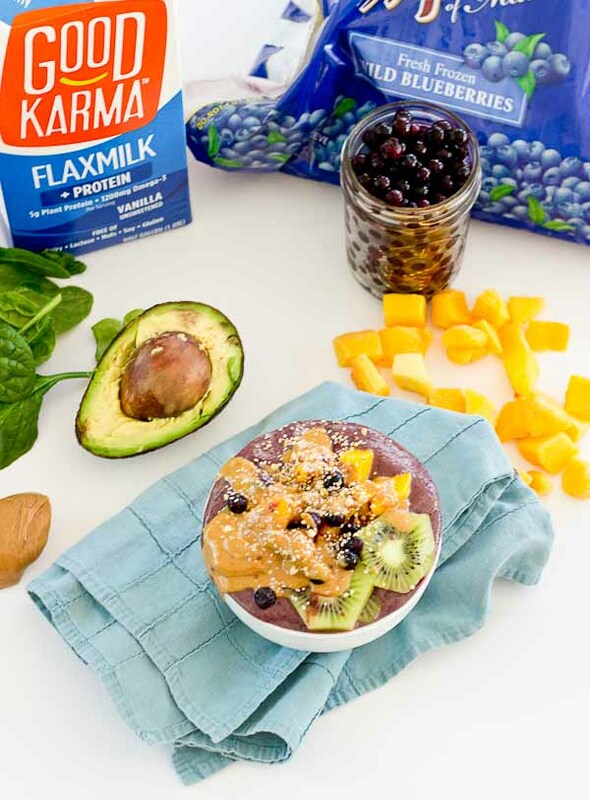 This smoothie bowl is not only super convenient and tasty, it’s made with superfoods like Wyman’s Wild Blueberries and Good Karma Flaxmilk! Oh yeah, there is a new milk in town made out of flaxseeds, and I’m loving it. It’s unsweetened and has a protein boost. 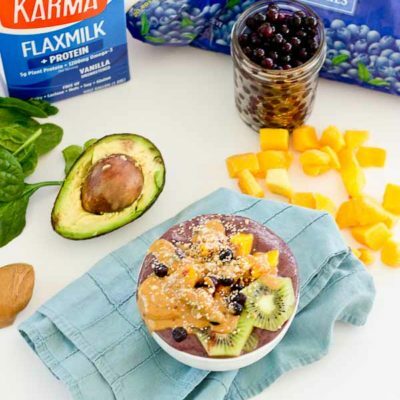 Bonus, this Summer Superfood Smoothie Bowl is vegan and gluten-free. Utilizing foods from the freezer and dairy aisle can help you save money too. Throwing out fruit at the end of the week? 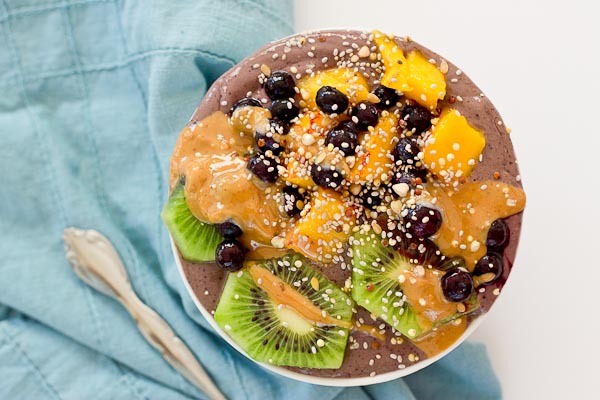 Round up your extra berries and throw them into a smoothie bowl for a nutrition-packed breakfast that saves you money and eliminates food waste. Bulk up when you can. Buying in bulk is often an easy way to save a few dollars, and super convenient when cooking for a larger crowd! Think frozen chicken, shrimp, fruit, and veggies. Meal prep! Plan out your meals for the week and make a shopping list to make sure you get the proper amount of every ingredient—no food waste! Worried about food expiring? Choose frozen instead of fresh! Frozen fruits and vegetables are sealed at the peak of ripeness and chock-full of nutrients, antioxidants, and minerals. Go meatless once a week! Combine eggs, cheese, and fresh vegetables for a protein-packed meatless meal. Frittatas are a weekend staple and a favorite way to use up leftovers in the fridge and freezer. Instead of eating out to satisfy your cravings, grab a frozen pizza and pair it with a fresh salad and grilled chicken for a healthier, cheaper alternative withmore veggies! Check for expiration labels – choose later expiration dates to avoid throwing out unused food. For more delicious ideas, visit EasyHomeMeals.com and Easy Home Meals on Facebook, Twitter and Pinterest. Blend for 1-2 minutes until smooth consistency. 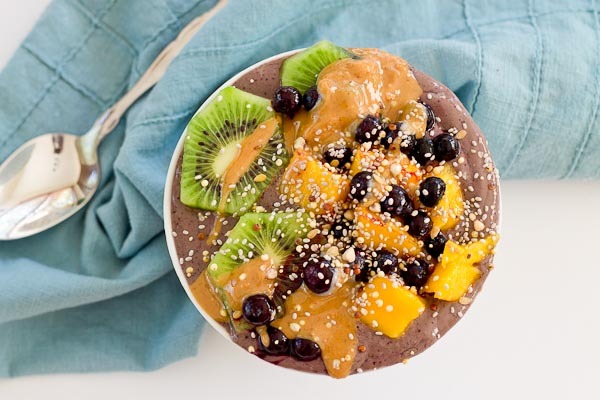 Pour into bowl and garnish with blueberries, mango, kiwi, almond butter, and seed blend. Seed blend nutrition information based on 1/2 teaspoon chia seeds and 1/2 teaspoon flaxseeds. Looks wonderful! I can’t wait to try it! Thk you! What is the seed blend? Looks delish! 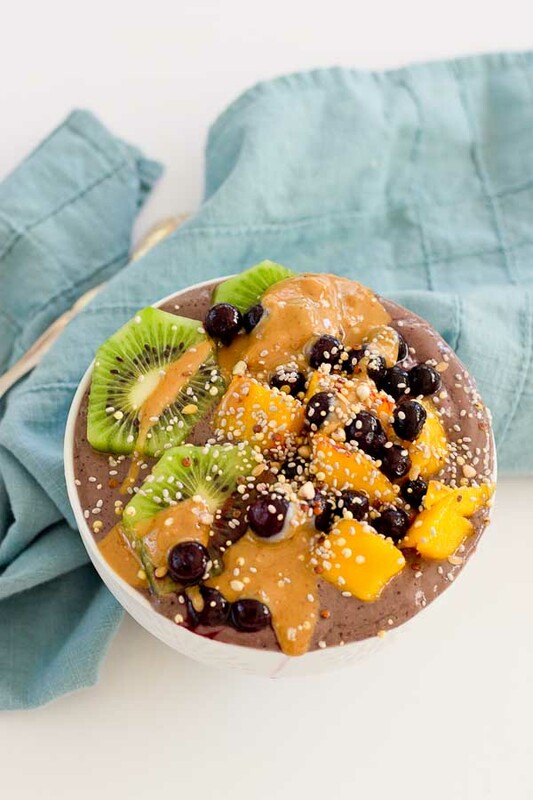 Holy COW this smoothie bowl looks like perfection! Perf for summer with all the wondrous toppings! Mmmmmm Im drooling! Ah, thanks so much! It is delish.